Free agent Darrelle Revis is headed back to the New York Jets from the New England Patriots. As my colleague Ben Morris wrote Wednesday, the NFL’s annual free agent market is not, by and large, where Super Bowls are won and lost. At best, it’s a place where teams tread water, paying the going rate for known talents. At worst, it’s where teams waste a ton of money. It’s not hard to see why: Because of “the winner’s curse,” the team that lands a coveted free agent (cough, Ndamukong Suh) is usually the one whose front office overestimated his value by the greatest amount. And with a hard salary cap in place, miscues of that sort mean another aspect of the team is necessarily handicapped with fewer resources as a result. Want more evidence that offseason roster reshuffling is pointless? 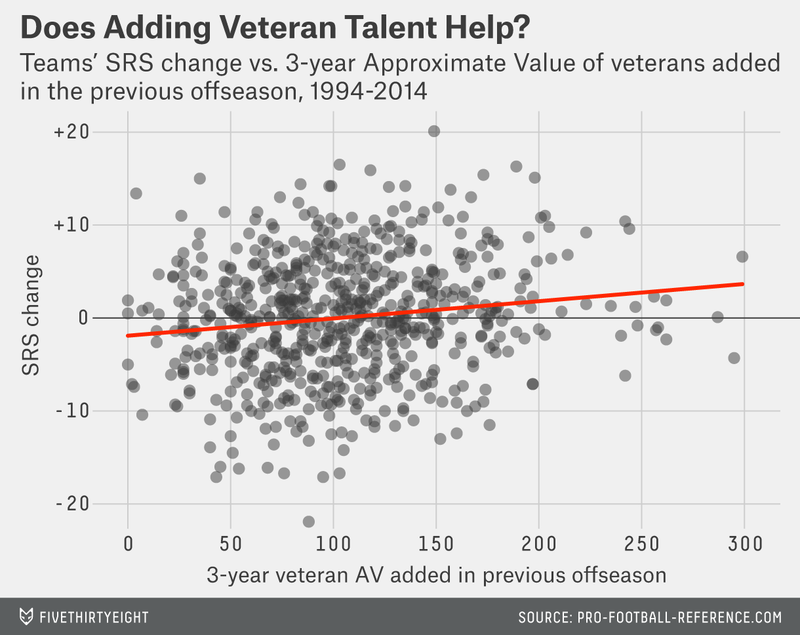 Going back to the advent of the NFL salary cap (before the 1994 season), I looked at the relationship between the Approximate Value (AV) of veteran players acquired by a team1 over the offseason and how much the team’s Simple Rating System (SRS) score improved the following season. 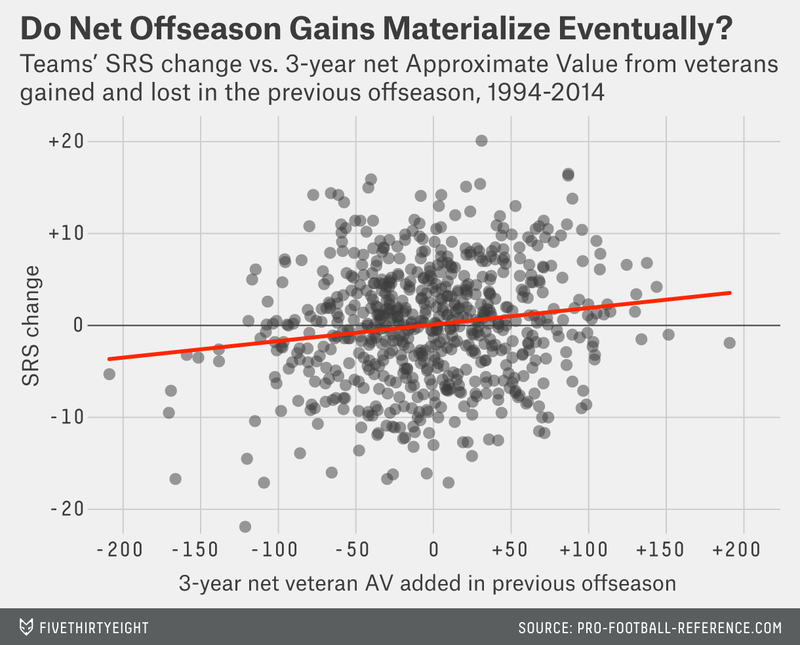 Whether you gauge the quality of incoming players using their AV from the prior season alone or their cumulative AV over the preceding three seasons, there’s essentially no connection between how much talent a team adds over the offseason and how much better (or worse) it gets that season. But maybe adding talent is only half the equation. There’s also the matter of preventing talent from leaving by re-signing veterans — or at least maintaining a positive mark in the offseason AV exchange ledger. However, even when looking at net veteran AV gained/lost over the preceding offseason, there’s still no relationship between a team’s ability to hoard proven talent in the offseason and its improvement or decline in the ensuing season. Free agency always feels like one of the most exciting parts of the NFL offseason. But if history is any guide, the vast majority of what happens this week will have little bearing on how much any given team improves or declines next season. Via free agency or trades.